I love that I now have the time and desire to read more. I just fnished reading the book, Spoon Fed, written by Kim Severson, Food Editor at the NY Times. It’s a great book for a number of reasons. I admire Kim for telling her story and not worrying about what the world thinks. I love how she weaves her life lessons around the kitchen table and the every day ritual of cooking and eating. I have some things in common with Kim, in addition to sharing her name. I love family, food, and cooking (and in that order). Prior to reading Kim’s book I really didn’t give much thought about the importance of cooking together and eating together as a family. The cooking and the sharing of a meal together promotes family unity. It brings us back to those long-ago, far away days of The Cleavers in the TV show Leave It To Beaver. Granted I don’t bring out the white linen table cloth or even eat at our formal dining room table, but we do sit together (outside this time of year) and talk. Food brings people together and gives them the opportunity to interact. Of course, even if a meal is made it doesn’t necessarily mean the family will eat it together – but it does provide an opportunity to do so. After reading Kim’s book, I couldn’t help but think back on some of the wonderful meals that I have had the good fortune to be a part of over the years. One particular memory came to mind that I hadn’t thought about for quite some time. Thanksgiving has always provided me and my family with a wealth of abundant and wonderful food and cooking that also lead to special time together. Those of you regular readers here know that my oldest daughter Elizabeth died in a fire in September, 2003. I will always remember the last Thanksgiving that we shared with her in November of 2002. We shared a wonderful meal of turkey and dressing and all of the wonderful dishes that go along with it. After a long while of sitting around the table and talking, we did the dishes and decided once they were done a game of some sort was in order. I don’t remember the name of this particular game, but it was charades of some sort. I don’t even remember if I actually played or who did play other than Liz. She was given the word thimble and she had to get the rest of the game participants to say it. The only problem was, Liz didn’t know what it was, or even what it was used for. So she described it as only Liz could – as a “finger condom.” Huh? Where in the heck did she come up with that? I remember being a tad horrified with my mom and my aunt sitting nearby. What on earth would they think hearing my daughter call a thimble a finger condom? Time ran out and Liz had to reveal the word. That’s a thimble we all cried out? What’s a thimble Liz asked looking perplexed. It’s used when sewing we all said. We laughed and laughed – where on earth did she come up with the phrase “finger condom.” Only Liz. Little did we know on that day just how important that “finger condom” would become for all of us. Every year when we once again gather to celebrate Thanksgiving, missing the physical presence of our beloved Liz, we all laugh and celebrate and ask if we can play a game … how about charades? Remember, the finger condom we all say. We laugh and remember and think of Liz in joy … which is just the way she would want it … her time with us was way too short and sometimes rocky … but it’s those finger condom moments that we now remember and it gives us the opportunity to laugh and remember Liz in JOY instead of sadness. Here is a link to Kim Severson’s website and further information on Spoon Fed. There is a new book club starting up in town. The first book selection is True Stories of Messages From Beyond by Julie Aydlott and Friends. I have been asked to be the kick-off speaker this Thursday night at 7:00 pm at the Hy-Vee Club room. Our paper did a story about it yesterday. I use the word amazing alot in my life … but so many things are amazing and wonderful. This blog link is no exception. I’ve come to know Phil Bolsta a little over the past few months, even though we have yet to meet in person. He is a fellow traveler on the spiritual path we each find ourselves on. It is a collection of 45 different life changing stories from a variety of prominent people. There was an event last October … six of the storytellers are featured in the link below. I believe you will find them as fascinating, interesting, amazing and just plain joyful as I have! I just finished reading a really good book! 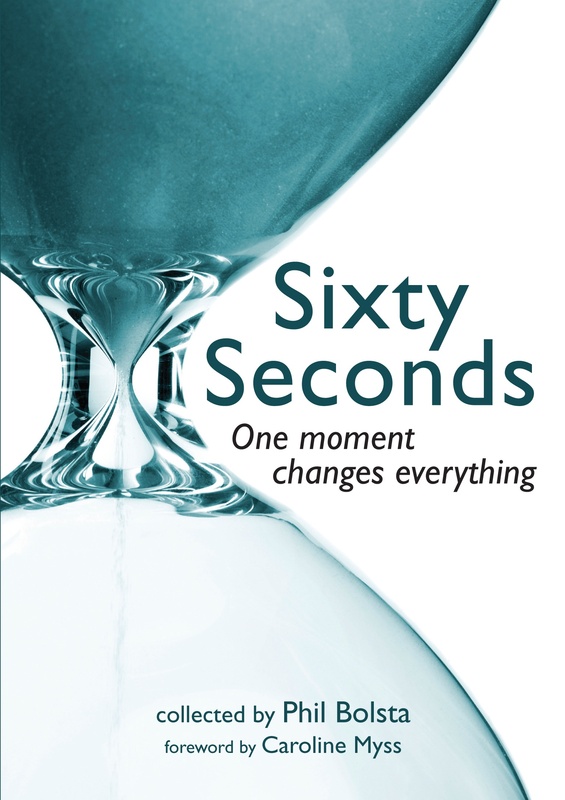 60 Seconds: One Moment Changes Everything by Phil Bolsta. It’s an easy read … if you have 5 minutes or 5 hours. It is a compilation of 45 different stories from many different people. It really speaks to the fact that everyone has a story and when we share our stories it is a win-win situation. The teller benefits just as much as the reader. And we can all put ourselves in these different situations and contemplate how we would have handled it … it may perhaps make us think about things in a new, different way … and that’s always good.